Should Fed Taper QE If Banks Get Most of the Benefits? President Vladimir Putin is canceling his oil and gas pipeline to Europe. To discuss why is our regular guest Michael Hudson. Michael is distinguished research professor of economics at the University of Missouri-Kansas City. His latest books are The Bubble and Beyond and Finance Capitalism and Its Discontents. Michael, so explain to us why this cancellation is taking place. MICHAEL HUDSON, PROF. ECONOMICS, UMKC: Europe has imposed something that seems bizarre on the face of it. It’s–in an attempt to isolate Russia, to sort of join America’s new Cold War policy, the Eurozone imposed what it called the third energy policy. And this policy says a company that produces oil and gas cannot own the pipeline; there has to be a separation in order to have a free market. Now, to show you how absurd this is, imagine if America had a policy that a building owner couldn’t own the elevators in the building. Suppose the landlords of the Empire State Building were not allowed to own the elevators in it. They had to say, well, for a free market, we need to have an elevator company ow the elevators. Well, you can imagine what would happen. The elevators would say, you want to go to the 60th floor? I’m sorry, that’ll be $5. Or would you like to walk? You want to go to the 80th floor? That’ll be $10. All of a sudden, the elevator operator would be able to get all of the rental value that the landlord of the Empire State Building had hoped. Well, this is why the U.S. neocons put in the Europeans’ hands the idea, don’t let Russia or Gazprom own the pipeline to give you gas. Let’s find a way of ripping Russia off. Let’s insist that the Americans and the Europeans own the pipeline, and then no matter what Russia charges for gas, we can say, you want to sell gas at $80 a barrel? Well, you’ll have to give us $10, $20, maybe $30 a barrel. Otherwise, we won’t let you send the gas over the pipeline. This is basically what Ukrainians have said to Russia: we want control of the pipeline so that we can hold Russia up for ransom. Well, Putin said that it was absolutely absurd to let another country build a pipeline and then say, Russia, you can’t export oil if you don’t sell it to our pipeline, and we’re going to take the money that you hope to get from emptying out the oil and gas in your ground. 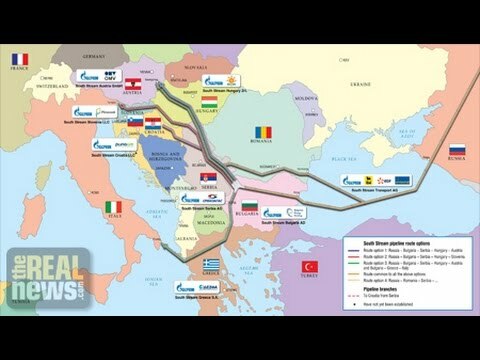 So Europe also said, well, we’re not going to let Gazprom, even in conjunction with the Italian National Energy Company and others, build what’s called South Stream, a pipeline to the south of Europe to serve Austria, Hungary, and Italy. Europe said, unless Europeans and Americans can own the pipeline, we’re going to stop it. So Mr. Putin said, well, look, if Bulgaria says that we can’t run a pipeline through Bulgaria because it’s hoping on someday joining the Eurozone, there’s no point in building a pipeline under the Black Sea and then all of a sudden there’s nowhere for it to go. So we’re not going to sell to Europe. In fact, Putin said, Europe is acting so self-destructively, so much against its economic interests, out of buying into the American hatred of Russia, that he has turned his back on Europe and said, instead of selling the South Stream pipeline that we’d hope to to Europe, we’re selling it all to Turkey. The agreement that he made last week with Turkey was for an equivalent amount of gas. All of the gas that was supposed to go to Hungary, Bulgaria, Italy, and other countries is now going to Turkey, and he’s going to India this week in order to sell other gas to India to follow up on his enormous gas deal with China before. So Europe is literally left out of the cold in this by following the American neocon advice and insisting that the Americans and the European banks own the pipeline to be able to turn it off at any point that they wanted to hurt Russia. Russia has not fallen for this, and canceled it. And we’re having as a result the biggest realignment in global geopolitics, in trade, and hence military alignment, that you’ve had since World War II. The whole world has changed in the last few weeks as a result of Europe’s self-destructive new Cold War. This has created enormous political splits within Germany and within Europe. But the result is that Russia has made what looks like a once-and-for-all change by realigning itself and making long-term agreements with Turkey, India, China, and Iran. HUDSON: It’s good to be here.